Well going around to each and every one of my neighbor's houses and lighting their mail on fire has finally come back to haunt me. As the only person on my block in possession of up to date discount restaurant coupons, as delivered by our proud and honorable postal carriers, I have control over the weekend eating fortunes of approximately 150 people. It's only a matter of time before they all - everyone of them - show up at my door demanding their share of "Free Entree of Equal or Lesser Value" vouchers. How am I to decide who gets the free breadsticks coupon to the Fish Barrel? Who am I to decide who gets the free breadsticks coupon to Fish Barrel? How can I possibly determine which family is deserving of 15% off their total bill at Randy's BBQ Pig Parts Pit and which family should get only Two Free Sides of Non-Animal Fat Origin from Randy's? I was planning on having these coupons laminated and hung up in my private basement gallery. Now, here, in front of the mob, I have no choice but to divide them up quickly before they begin gnawing on my home's corner bricks. WELL I'LL TELL YOU SUCKAS WHAT I'M GONNA DO. YOU CAN HAVE ALL THESE COUPONS TO THE MUSHROOM BUFFET. PLACE IS JUNK, SERVES ONLY MUSHROOMS TO A GROWN MAN. YOU CAN EVEN HAVE THIS FLYER ENTITLING THE BARER TO HIS CHOICE OF UGLY CRABS DOWN AT CAPT HAZZENPLAT'S SEAFOOD TROUGH. I DON'T CARE. I NEVER WANTED TO BE GOD! All I wanted to do was prevent you from reading mail from out of state that could quite possibly paint an unflattering picture of our fine and noble county and its decision to force us all to address each other as Mr. & Mrs. Salt and Pepper Such and Such while out in public. The outside world is cruel and doesn't understand our reasoning for denying the individual citizen their identity insofar as spoken greetings are concerned. I didn't give a damn about restaurant coupons. Well going around to each and every one of my neighbor’s houses and lighting their mail on fire has finally come back to haunt me. As the only person on my block in possession of up to date discount restaurant coupons, as delivered by our proud and honorable postal carriers, I have control over the weekend eating fortunes of approximately 150 people. It’s only a matter of time before they all – everyone of them – show up at my door demanding their share of “Free Entree of Equal or Lesser Value” vouchers. How am I to decide who gets the free breadsticks coupon to the Fish Barrel? Who am I to decide who gets the free breadsticks coupon to Fish Barrel? How can I possibly determine which family is deserving of 15% off their total bill at Randy’s BBQ Pig Parts Pit and which family should get only Two Free Sides of Non-Animal Fat Origin from Randy’s? I was planning on having these coupons laminated and hung up in my private basement gallery. Now, here, in front of the mob, I have no choice but to divide them up quickly before they begin gnawing on my home’s corner bricks. WELL I’LL TELL YOU SUCKAS WHAT I’M GONNA DO. 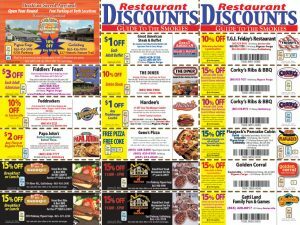 YOU CAN HAVE ALL THESE COUPONS TO THE MUSHROOM BUFFET. PLACE IS JUNK, SERVES ONLY MUSHROOMS TO A GROWN MAN. YOU CAN EVEN HAVE THIS FLYER ENTITLING THE BARER TO HIS CHOICE OF UGLY CRABS DOWN AT CAPT HAZZENPLAT’S SEAFOOD TROUGH. I DON’T CARE. I NEVER WANTED TO BE GOD! All I wanted to do was prevent you from reading mail from out of state that could quite possibly paint an unflattering picture of our fine and noble county and its decision to force us all to address each other as Mr. & Mrs. Salt and Pepper Such and Such while out in public. The outside world is cruel and doesn’t understand our reasoning for denying the individual citizen their identity insofar as spoken greetings are concerned. I didn’t give a damn about restaurant coupons. Maybe you should hide them under your driveway. That way no one will be able to find them.